In the West Gallery, “Chornobyl: Impact & Beyond,” nine artists have created works with a range of subject matter related to Chornobyl before, during and after the incident, as well as its wider impact physically and conceptually. Artists Ricardo Manuel Díaz, Yhelena Hall, Karolina Kowalczyk, Dominic Sansone, Anaïs Tondeur, Jave Yoshimoto, Eden Unluata, Tara Zanzig and Igor Zaytsev hail from many different backgrounds and from all over the world, including Chicago, France and Ukraine. The human toll of the disaster is addressed in Díaz’s metaphorical painting about emptiness and evacuation, Sansone’s multi-headed sculpture referencing the lives lost, and Zanzig’s painting and street art series that depicts the long term effects on those exposed to radiation. Chornobyl’s natural environment is explored in Hall’s sculptural plant installation on the absorption of the manmade by nature, Kowalczyk’s layered work on paper about the impact of radioactivity on flora and fauna, and Tondeur’s photograms that document the invisible scars left upon that which grows in irradiated soil. Zaytsev’s and Yashimoto’s pieces consider the power of creative and destructive forces. Throughout the exhibition, Unluata will be activating a site-specific installation with a Turkish tea ceremony performance addressing the radioactive impact on the tea grown and consumed in nearby Turkey. In addition to “Chornobyl: Impact & Beyond,” the Ukrainian Institute of Modern Art has commissioned a fine art print portfolio project and exhibition entitled, “Chornobyl: Artists Respond,” the contents of which will be on display in the East Gallery. UIMA invited 30 Chicago artists to participate in this project, each artist creating an edition of 40 original prints for the portfolio in remembrance of the event. 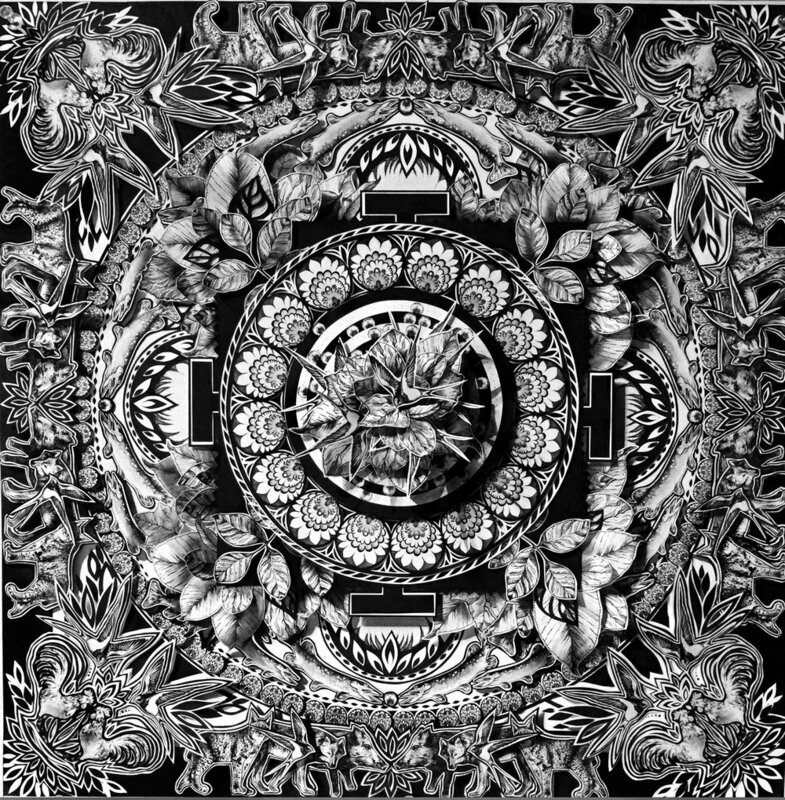 The artists, who come from different cultural backgrounds, approached this project from unique perspectives, reflecting on their individual experiences and knowledge of the Chornobyl disaster. The completed prints feature a range of themes, from scenes of the Chornobyl accident and its aftermath, to commentary on its current state, and its correlation to other nuclear accidents. Just as varied as the artists’ points of view are the techniques with which they chose to create their prints, from the traditional media of screenprints, etchings and lithographs, to more unconventional methods incorporating natural and non-art materials. While the exhibitions and the portfolio are composed of a multitude of voices and perspectives, they are all united in remembrance. 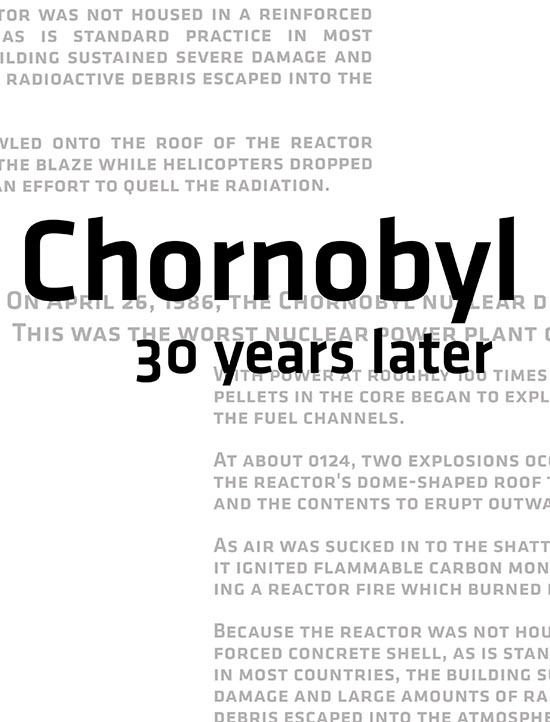 Though Chornobyl was 30 years ago, it is clear that the disaster and its memory are just as potent today. 56.5" x 54.5" x 1.5"